Who would have ever thought that so much power could be packed inside such a tiny, humble seed? The nigella sativa (aka black seed, black cumin, black caraway, black sesame, onion seed, Roman coriander) is an annual flowering plant from the family Ranunculaceae. This plant is native to southwest Asia and grows to be just under one-foot tall. There have been in excess of 700 peer reviewed studies done on this little seed that demonstrate its therapeutic value. It is amazing how many conditions that this seed can impact. This active ingredient in black seed is revered for its anti-oxidant, anti-inflammatory and anticancer properties. Acting as a free radical scavenger, TQ also preserves the detoxifying antioxidant enzymes glutathione peroxidase and glutathione-S-transferase. Both of these play an important role protecting the liver from toxins. A relative to thymoquinone, thymohydroquinone is a potent natural acetylcholinesterase (AChE) inhibitor. These chemicals are vital for the role they play in halting enzyme activity. This gives more time and amount of the neurotransmitter acetylcholine to remain in the brain. Conditions such as Alzheimer’s disease, autism, apathy, dementia, schizophrenia, Parkinson’s disease and neurodegenerative conditions are treated by pharmaceutical grade acetylcholinesterase inhibitors. Thymol is found in thyme essential oil and has many therapeutic properties. It is often used as a tuberculosis and virus remedy. It can also be employed as a general disinfectant and non – toxic pesticide. Cancer fighter: A study out of Croatia found that a combination of TQ and THQ resulted in a 53% reduction in tumor cells in mice. Researchers have also studied the combination of TQ and conventional chemotherapy drugs and found that the impact was greater than chemotherapy alone and may result in a reduced toxic load from the chemotherapy drugs. Fasting glucose: Just two grams of black seed each day can reduce your fasting glucose levels, decrease insulin resistance, increased beta-cell function and reduce glycosylated hemoglobin ( HbA1c). Asthma: The nigella sativa seed contains thymoquinone, which has been proven to work better than fluticasone (an asthma medication). 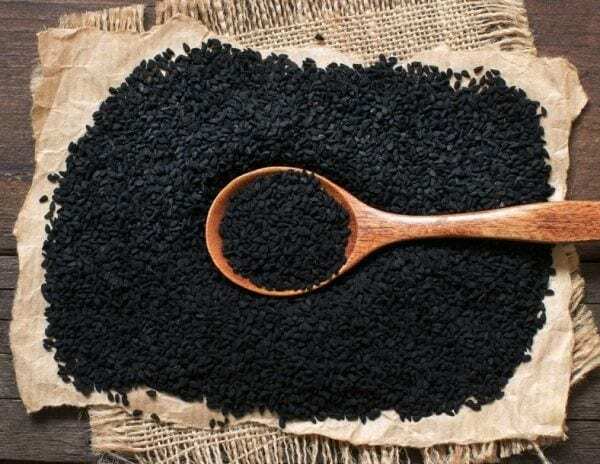 In human studies it has been found that boiled water extracts of black seed have a powerful antiasthmatic properties. Fever: Black seed oil will make you sweat which can help cool the body and release toxins. One teaspoon of black seed oil (available to buy from this page) once a day when you have a fever will bring down your temperature. Also, be sure to drink plenty of fluids. Toothaches: If you have soreness and pain from a toothache, rub a small amount of black seed oil on your gum and tooth for about 15 seconds. Also, you can mix a little oil with some warm water and gargle to relieve pain. High blood pressure: Research shows that taking a daily dose of 100 to 200 mg of black seed extract twice a day for two months can lower blood pressure in mildly hypertensive people. Nausea: Research shows that black seed oil can help with an upset stomach and nausea. Mix half a teaspoon of fresh ginger juice with half a teaspoon of black seed oil. Drink this twice a day for relief. Diarrhea: Black seed oil has been found to be helpful in the case of diarrhea. Mix a teaspoon of the oil in some organic yogurt and enjoy until your symptoms dissapear. Liver health: We need our liver to work efficiently in order to effectively rid our body of toxins. In addition, the bile from the liver is necessary in order to digest fats and keep your mind healthy. Poor liver function can be improved remarkably with black seed oil. It can help your liver function efficiently and prevent damage and disease. Weight loss: Black seed oil is a potent anti-obesity plant mostly due to its anti-inflammatory properties. The oil works by reducing the triggers that initiate weight gain. Hair strength: Black seed oil can help restore hair loss. The powerful antioxidant and antimicrobial properties help strengthen hair follicles which promotes growth, shine, texture and manageability. Infections (MRSA): Methicillin resistant Staphylococcus aureus ( MRSA) is a dangerous superbug that sweeps through hospitals and nursing homes as regular staph infections are becoming increasingly resistant to antibiotics. High-risk groups include the elderly and people with already compromised immune systems. Black seed oil has been shown by Pakistani scientists found that various strains of MRSA were sensitive to N. Sativa, which slowed down or stopped MRSA from spreading uncontrollably. Brain damage from lead: According to a study published in Experimental and Toxicologic Pathology, black seed can slow and reverse damage to the brain that is caused by lead toxicity. Our top pick are these Organic Raw Black Cumin (Nigella Sativa) Seeds. These are the top rated black seeds on Amazon, but there are other products available which you can browse using the Amazon widget below. Black seed is a remarkable gift from nature with significant health properties that make it truly a top natural remedy! Further Reading: Black Seed Oil: The Most Powerful Oil In The World?